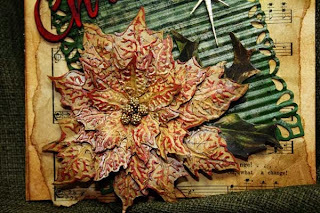 Tim Holtz Tattered Poinsettia die is one of my favorite dies, especially since Sizzix introduced the embossing folder for it. 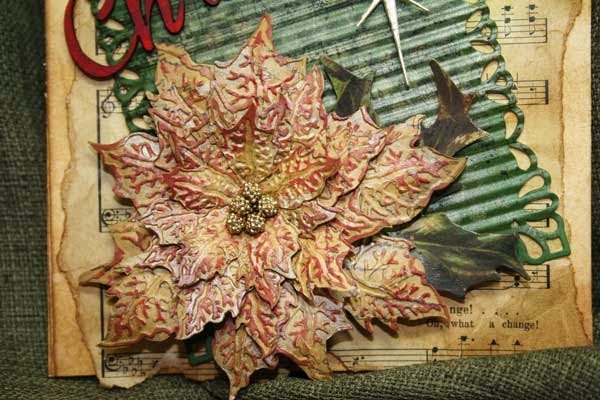 All you have to do is cut out the Poinsettia, ink the ends of the flowers, stamp with a script sentiment and then place the petals in the embossing folder and run it through your die cutting machine. It is like magic. Look at that beautiful texture. One thing I love about this die is it cuts out the flower complete, no gluing of petals. All you have to glue are the layers. After conditioning the Poinsettia flowers with my Susan Cockburn tool kit, I use something new to me called MARSHMALLOW-3D Foam Shapes to color the embossing. These Foam Shapes are firm and the color stays only on the raised area. The petals were layered, glued and a Magnolia berry cluster was added to the middle for the Stamen. I have a very old Hymn book that I tore and inked to make it look really old. 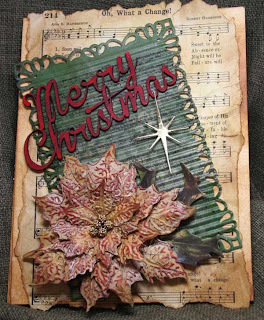 Then the green cardstock was first stenciled with Antique Linen Paint and inked with different colors of distressed ink (the ink does not cover over the paint) and cut out of the Spellbinder die. At that time it was stamped with Tim's music and then pleated with my Fiscar's Crimper Tool. Kaiser Kraft has these nice wooden Merry Christmas Sentiments that was inked with Barn Door Red Distressed Paint. June who sales the Easy Frames has a video using the Foam Marshmallows that you can see here! She shows it near the end of the video. WOW! Absolutely STUNNING Joan! LOVE that poinsettia ... what vintage gorgeousness! And your design with the hymn page ... WOW just beautiful! Aren't those 3d marshmallow pods fun to use. They are awesome for creating backgrounds and PERFECT for creating a MOON on your scenery images. Have a great day ... stay warm ... a bit of snow is on the way I hear! Joan, I have never heard of marshmallow 3-d foam shapes. I don't see on your card where they are used. Can you please explain further or perhaps direct me to a video that shows what they are and how to use them? This Poinsettia is so beautiful and so real looking just stunning. Oh and I really like the idea that you don't have to do all that cutting and glueing to get a flower made. Quick and to the point is wonderful and TH has it all together for sure. From looking at this seems you could make a couple of sized if you wanted as well with this die. Can't wait to get the embossing folder. A lovely card, and that poinsettia is just stunning!! Thanks so much for explaining how you got that effect! And for the tip on those marshmallow rounds--they sound very useful. Oh Joan, I love everything about this card. It is a perfect Christmas card! Ditto all the above, I can't compete with all those comments. Stunning Joan. Your card is stunning! Really like the poinsettia and the hymnal page in the background. Beautiful work! The poinsettia is gorgeous and love the vintage look of this Christmas card. Will have to try to make one just like it since I want the vintage look this year. I will need to find out more about that 3D ink. This card is stunning. Thanks for sharing and for the products used and instructions. I might just have to try this one. Gorgeous~gorgeous...and it is even more so "in real life"...yes I was lucky enough to get to see the real thing...love the vintage look of it, a stunning job....and can't wait to try those pod thingies....can't wait to see what you come up with next! !